#First two authors contributed equally to this work. Purpose: Thrombosis and thromboembolic occlusions of blood vessels are a major complication in various peripheral vascular diseases. The agents for the inhibition of platelet function are recognized as key tools in the treatment of atherothrombosis. Therefore, it became a mainstay medication for a wide range of vascular diseases. Polyozellin (POZ), a major constituent of an edible mushroom Polyozellus multiplex, was reported to have anti-oxidant, anti-angiogenesis, anti-cancer, and anti-inflammatory effects. However, anti-platelet effect of POZ has not been investigated yet. Methods: In our study, the anti-platelet activities of POZ were measured by thrombin- or collagen-induced platelet aggregation in vitro, adenosine diphosphate (ADP)-induced platelet aggregation in vivo, and the thrombus formation in vivo. Results: POZ effectively inhibited the platelet aggregation not only in vitro using freshly isolated human platelets, but also in vivo thrombin or collagen-induced platelet aggregation. In accordance with the anti-platelet activities in vitro, POZ enhanced anti-thrombotic effect in vivo pulmonary embolism model and arterial thrombosis model. Conclusion: These results indicate that POZ possesses anti-platelet activities and might be useful for developing the drug candidates or functional foods for treatment of cardiovascular diseases without side effects. Polyozellin, Thrombin, Collagen, Coagulation, Antiplatelet, Antithrombotic, Aggregation. Platelets belong to blood cells that participate in the human primary hemostatic mechanism. Platelets need to be activated to perform all of their functions, and this activation can be initially produced after an endothelial injury that exposes subendothelial structures to the blood flow . The interaction of platelets each other which means aggregation has the final purpose to produce a platelet thrombus that constitutes the primary hemostatic plug . In addition, platelet aggregation plays a critical role in the pathophysiology of thrombotic diseases, and as a consequence, anti-platelet agents have been used clinically in patients at risk for brain ischemia, unstable angina, and acute myocardial infarction [1,2]. Therefore, it has been recognized that the interaction between platelets and blood vessels has the important role in development of thrombosis and cardiovascular diseases . Uncontrolled platelet aggregation is critical in arterial thrombosis and may cause life threatening disorders such as heart attacks, unstable angina and re occlusion after angioplasty . Hence, the inhibition of platelet aggregation could be a potential strategy for treatment and prevention of these cardiovascular diseases. Polyozellus multiplex (Thelephoraceae) is an edible black mushroom and grows wild in Korea and Japan . Particularly in Korea, this is harvested in early autumn and used as a food after blanching in boiling water. 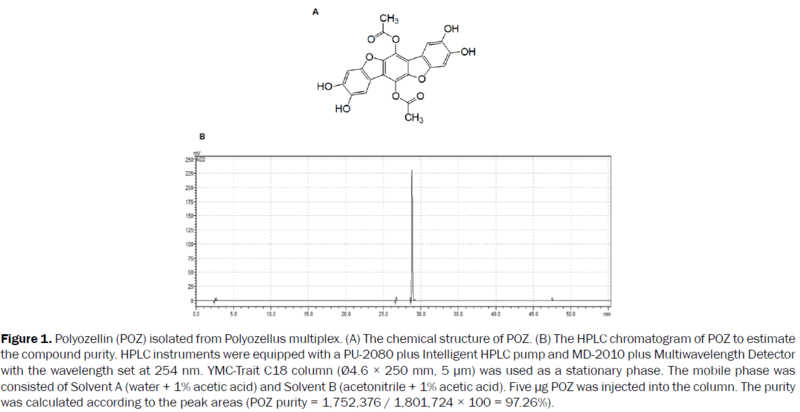 In the previous study, the constituents of P. multiplex have been isolated and their chemical structures were determined such as kynapsin-12, -13, -28, thelephoric acid, and polyozellin (POZ) [5-7]. And the biological activities were also evaluated, for example, kynapcin-12, -13, and -28 revealed the inhibitory effects on prolyl endopeptidasep [6,7]. Thelephoric acid inhibited the activities of human cytochrome P450 family members in does- and time-dependent manner in vitro . POZ showed anti-cancer effect on a mouse hepatoma cell line Hepa1c1c7 by enhancement of the activities of quinone reductase and glutathione S-transferase, and glutathione content , and it also inhibited the lipopolysaccharide (LPS)-induced activation of nuclear factor-κB (NF-κB) and c-Jun N-terminal kinase (JNK) in a mouse macrophage cell line Raw 264.7 . Moreover, tumor necrosis factor (TNF)-α-mediated interleukin-8 (IL-8) and matrix metalloproteinase-7 (MMP-7) production were decreased in the human intestinal epithelial cell line HT-29 by POZ . However, there are still rare reports to investigate about the anti-coagulant and anti-platelet activities of POZ. Since recent studies suggested POZ could act as anti-oxidant  and anti-inflammatory agents [10,11], thus POZ was expected to reveal the anticoagulant and anti-platelet effects. In this study, we examined the effect of POZ on platelet aggregation and thrombus formation in vitro and in vivo systems. Thrombin, collagen, epinephrine, adenosine diphosphate (ADP) were obtained from Sigma (St. Louis, MO). Polyozellus multiplex (PM) was collected at Mt. Odaesan, Gangwon-do, Korea in September 2001 and identified by Prof. Kyung-Sik Song at Kyungpook National University. A voucher specimen (NPM-PM-2001) was deposited at the Laboratory of Natural Products Medicine, Kyungpook National University. The dried fruiting body of PM (1.0 kg) was refluxed twice with MeOH for 3 h. The extract was filtered and concentrated to dryness by a rotary evaporator (EYELA, Tokyo, Japan). The Methanolic extract (204.0 g) was suspended in distilled water and successively partitioned with organic solvents such as benzene, CHCl3, and EtOAc. The EtOAc soluble fraction (2.1 g) was washed with 100 mL of EtOAc, and the residue (1.2 g) was suspended in 500 mL of MeOH. Then the suspension was centrifuged at 3,000 g for 5 min. The precipitate was discarded and the supernatant was concentrated. The resultant residue was further purified on Senshu Pak ODS high performance liquid chromatography (HPLC). Elution with MeOH: H2O = 65:10 containing 1% acetic acid afforded compound 1 (512.0 mg) as dark green powder. The chemical structure of isolated compound was determined by the comparison of its NMR spectral data with those in the reference . 1H-NMR (400 MHz, DMSO-d6+CHCl3-d): δ 9.20 (2H, brs, phenolic OH), 8.70 (2H, brs, phenolic OH), 7.20 (2H, s, H-1 and H-7), 7.20 (2H, s, H-4 and H-10), 2.53 (6H, s, -CH3). 13C-NMR (100 MHz, DMSO-d6+CHCl3-d): δ 168.0 (C=O), 151.0 (C-4a and C-10a), 146.4 (C-3 and C-9), 142.8 (C-2 and C-8), 137.6 (C-5a and C-11a), 130.8 (C-6 and C-12), 116.9 (C-6a and C-12a), 113.5 (C-6b and C-12b), 106.1 (C-1 and C-7), 98.8 (C-4 and C-10) (Figure 1A). To determine the purity of isolated POZ, we performed the high-performance liquid chromatography (HPLC) analysis. The HPLC instruments were equipped with a PU-2080 plus Intelligent HPLC pump and MD-2010 plus Multi wavelength Detector from JASCO (Tokyo, Japan) with the wavelength set at 254 nm. In addition, an YMC-Trait C18 column (Ø4.6 × 250 mm, 5 μm, YMC America, Allentown, PA, USA) was used as a stationary phase. The mobile phase was consisted of water (Solvent A) and acetonitrile (Solvent B; Merck Millipore, Darmstadt, Germany) each containing 1% acetic acid (HOAc; Merck Millipore). For the eluent gradient, Solvent B was held at 5% for 5 min, increased from 5% up to 100% in 40 min, held at 100% for 5 min, decreased to 5% for 5 min, and held again at 5% for 15 min. The flow rate was 1.0 mL/min, and 5 μg POZ was injected into the column. The purity (≥ 97%) was calculated according to peak areas (Figure 1B). Figure 1: Polyozellin (POZ) isolated from Polyozellus multiplex. (A) The chemical structure of POZ. (B) The HPLC chromatogram of POZ to estimate the compound purity. HPLC instruments were equipped with a PU-2080 plus Intelligent HPLC pump and MD-2010 plus Multiwavelength Detector with the wavelength set at 254 nm. YMC-Trait C18 column (Ø4.6 × 250 mm, 5 μm) was used as a stationary phase. The mobile phase was consisted of Solvent A (water + 1% acetic acid) and Solvent B (acetonitrile + 1% acetic acid). Five μg POZ was injected into the column. The purity was calculated according to the peak areas (POZ purity = 1,752,376 / 1,801,724 × 100 = 97.26%). Male C57BL/6 mice (6 to 7 weeks old, around 27 g of body weight) purchased from Orient Bio Co. (Sungnam, Korea) were used in this study after a 12-day acclimatization period. Animals were housed five per polycarbonate cage under controlled temperature (20 - 25°C) and humidity (40 - 45%) and a 12:12 hour light/dark cycle. During acclimatization, animals were supplied a normal rodent pellet diet and water ad libitum. All animals were treated in accordance with the Guidelines for the Care and Use of Laboratory Animals issued by Kyungpook National University (IRB No. KNU 2012-13). Primary HUVECs were obtained from Cambrex Bio Science (Charles City, IA) and maintained as previously described [12-20]. All experiments were performed using HUVECs at passage 3–5. Mice were fasted overnight and POZ (1.8, 44, 8.8, or 17.5 μg/mouse) in Tris-buffered saline (TBS) was administered by intravenous (i.v.) injection. One hour post administration, 0.1 mL of arterial blood samples were withdrawn into 3.8% Na-citrate (1/10, v/v) for ex vivo activated partial thromboplastin time (aPTT) and prothrombin time (PT) determination. aPTT and PT were determined using a Thrombotimer (Behnk Elektronik, Norderstedt, Germany), according to the manufacturer’s instructions. In brief, 100 μL of citrated mouse plasma was incubated for 3 min at 37°C followed by the addition of 100 mL aPTT assay reagent. After incubation for 1 min at 37°C, 100 μL of 20 mM CaCl2 was added and the clotting times were recorded. For PT assay, 100 μL of citrated mouse plasma was incubated for 3 min at 37°C. Then, 200 μL PT assay reagent which was pre-incubated for 10 min at 37°C, was added and clotting time was recorded. PT results are expressed in seconds and as International Normalized Ratios (INR), and aPTT results are expressed in seconds. The concentrations to double clotting time were calculated from the equation of each line. Blood was collected from human volunteers by venipuncture and it was drawn into a plastic syringe containing 3.8% trisodium citrate solution (1/9, citrate/blood, v/v). The healthy male volunteers had not taken any drugs for 7 days at least before blood collection. Platelet rich plasma (PRP) was prepared by centrifugation at room temperature (RT) for 15 min at 150 ×g. PRP was adjusted to a concentration of 3 × 108 platelets/mL by hemacytometer cell counting and washed with TBS in the presence of 1 mM CaCl2. Washed platelets were incubated with indicated concentrations of POZ in TBS for 3 min, and then stimulated by 0.1 U/ mL thrombin (Sigma) in 0.9% saline for 5 min or 5 μg/mL collagen for 15 min at 37°C. Platelet aggregation was recorded using an aggregometer (Chronolog, Havertown, PA). The study protocol (KNUH 2012-01-010) was approved by the Institutional Review Board of Kyungpook National University Hospitals (Daegu, Republic of Korea). Platelet-rich plasma (PRP) was obtained from syngeneic donor mice by double centrifugation (200 g to create platelet/ plasma phase, 500 g to pellet platelets). The platelet-rich plasma was adjusted to a concentration of 1 x 109 platelets/mL with use of a hemocytometer for cell counts. Mouse platelets from PRP were washed once with HEPES buffer (5 mM HEPES, 136 mM NaCl, 2.7 mM KCl, 0.42 mM NaH2PO4, 2 mM MgCl2, 5.6 mM glucose, 0.1% BSA (w/v), pH to 7.45) in the presence of 1 mM CaCl2. Mice were administered with POZ (1.8, 44, 8.8, or 17.5 μg/mouse) in TBS by i.v. injection or oral consumption after fasting overnight. After 24 h, PRP (109 platelets/mL) in a volume of 240 μL were incubated at 37°C for 1.5 min in the aggregometer with continuous stirring at 1000 rpm and stimulated with 10 μL ADP. Changes in light transmission were recorded for 7 min after stimulation. The extent of aggregation was expressed as a percentage of the maximum light transmittance, obtained with the suspension buffer (washed platelet aggregation). The cytotoxicity of POZ on platelet was assessed by the leakage of lactate dehydrogenase (LDH) from platelets. After incubation with POZ at 37°C for 3 min, aliquots were collected and centrifuged at RT for 2 min at 12,000 ×g. Fifty μL of supernatant was added to 1 mL Tris-EDTA-NADH buffer [56 mM Tris (hydroxymethyl) aminomethane, 5.6 mM EDTA, 0.17 mM β-NADH, pH 7.4], and incubated at 37°C. After 10 min, 100 μL of 14 mM pyruvate which was pre-incubated at 37°C was added. The reduction of the absorbance at 340 nm resulted by the conversion of NADH to NAD+ was measured for the evaluation of LDH activity in the aliquots. The extent of LDH leakage was expressed as the % of total enzyme activity lysed with 0.3% Triton X-100. To determine the viability of HUVECs, 3-(4,5-dimethylthiazol-2-yl)-2,5-diphenyltetrazolium bromide (MTT, Sigma) was used. Cells were grown in 96-well plates at a density of 5 × 103 cells/well. After 24 h incubation, cells were washed with fresh culture media to treat POZ for 48 h. POZ-treated cells were washed and incubated with 100 μL of 1 mg/mL MTT for 4 h. The blue crystal formazan produced by live cells was solubilized by 150 μL TBS before measurement of the absorbance at 540 nm using a microplate reader (Tecan, Grödig, Austria). The FeCl3-induced thrombosis mouse model was established as previously described . POZ (1.8, 44, 8.8, or 17.5 μg/mouse) in TBS was administered by i.v. injection into overnight-fasted mice, and mice were anesthetized using 3% isoflurane (Forane®, Choongwae Pharmaceutical, Seoul, Korea) followed by the injection of 0.1 mL of 0.1% rhodamine 6G (Sigma), intravenously. A testicular artery (200 μm in diameter) was carefully exposed and a cotton thread (0.2 mm in diameter) saturated with 0.25 M FeCl3 was applied to the adventitial surface for 5 min. The cotton thread was removed to flush the wound with saline. The size of thrombus formation in the testicular artery was subsequently monitored with hematoxylin-eosin (HE) staining. The microscopic images were digitized with a photosensitive color charge-coupled device camera (L-600; Leica). The findings are scored according to following categories: 0, no thrombus; 1, small thrombus (50 × 75 μm); 2, medium-sized thrombus (100 × 150 μm); 3, large thrombus (200 × 300 μm). The time from FeCl3-induced endothelial injury to occlusion of the testicular artery by a large thrombus was measured as the interval between the initiation of vascular injury and the onset of stable occlusion. After fasting the mice for overnight, they were divided into 10 mice/group and administered POZ (1.8, 44, 8.8, or 17.5 μg/mouse) in TBS by i.v. injection. One hour later, the mixture consisted with 500 μg/kg collagen and 50 μg/kg epinephrine for acute thrombosis was injected to the vein of mouse tail. Each mouse was carefully observed for 15 min to determine whether the mouse was paralyzed, dead or recovered from the acute thrombotic challenge. For statistical analysis, five separated experiments were performed. Data are expressed as the mean ± SEM from three independent experiments at least. Statistical significance between two groups was determined via Student’s t-test. p< 0.05 was recognized as statistical significance. We observed the effects of POZ on thrombin- or collagen-mediated platelet aggregation. POZ significantly suppressed the mouse platelet aggregation mediated by 0.1 U/mL thrombin or 5 μg/mL collagen in a concentration-dependent manner (Figure 2A). It was shown that the half maximal inhibitory concentration (IC50) of POZ in PRP was 18.4 μM and 19.7 μM, respectively, according to the inhibition curve. In addition, we also induced the platelet aggregation via 5 μM ADP ex vivo, since there is a previous literature about ADP could induce the platelet aggregation in vivo . Figure 2B showed that the inhibitory effects of POZ (at 10 and 20 μM) on ex vivo platelet aggregation induced by ADP. And the inhibitory effects of orally administrated POZ were worse than those of injected POZ. In addition, POZ also inhibited thrombin or collagen induced platelet aggregation in vivo (data not shown). It was known that the average of circulating blood volume for mice is 72 mL/kg in the previous report , thus, the injected amount of POZ such as 1.8, 4.4, 8.8, and 17.5 μg/mouse yielded a maximum concentration of 2, 5, 10, and 20 μM, respectively, in the peripheral blood by which the averages of body weight and blood volume of mice were 27 g and 2 mL, respectively. Figure 2: The effets of POZ on platelet aggregation in vitro and ex vivo. (A) The washed platelets were treated with POZ at the indicated concentrations for 3 min, and stimulated by 0.1 U/mL thrombin (Th, white bar) for 5 min or 5 g/mL collage (Col, black bar) for 15 min at 37°C. Then, the aggregation was recorded. (B) Mice were administered with POZ via i.v. injection (white box) or oral consumption (black box) followed by the monitor of mouse platelet aggregation mediated by 5 μM ADP. Data represent the mean ± SEM of three independent experiments performed in triplicate. TBS is the vehicle control. *, p<0.05 as compared to thrombin/collagen alone (A) or ADP alone (B). Subsequently, the LDH leakage from platelet was analyzed to determine whether POZ has the cytotoxicity on platelet or not. The LDH leakage induced by POZ treatment was not observed, whereas that of 50 μM digitonin was significantly increased compared to control (Figure 3A). This data suggested that POZ does not affect to the platelet integrity. Moreover, the HUVECs viability was not affected by POZ treatment for 24 h, at the concentrations from 5 to 100 μM (Figure 3B). Figure 3: The effects of POZ on cytotoxicity and cell viability. (A) The release of LDH was measured to assess the cytotoxicity of POZ in platelets. (B) The effect of POZ on HUVECs viability was determined using MTT. Data represent the mean ± SEM of three independent experiments performed in triplicate. TBS is the vehicle control. *, p<0.05 as compared to D (A). The FeCl3-induced carotid artery thrombosis rat model has been established  and used to investigate the antiplatelet effects. Figure 4 shows the results of the time to thrombus formation and the size of thrombi affected by POZ. When the control mice were induced the endothelial injury via FeCl3, the growth of large thrombi occurred in 8.5 ± 1.1 min, while an anti-platelet GP IIb/IIIa inhibitor, tirofiban, significantly slowed down to 62.4 ± 5.4 min. 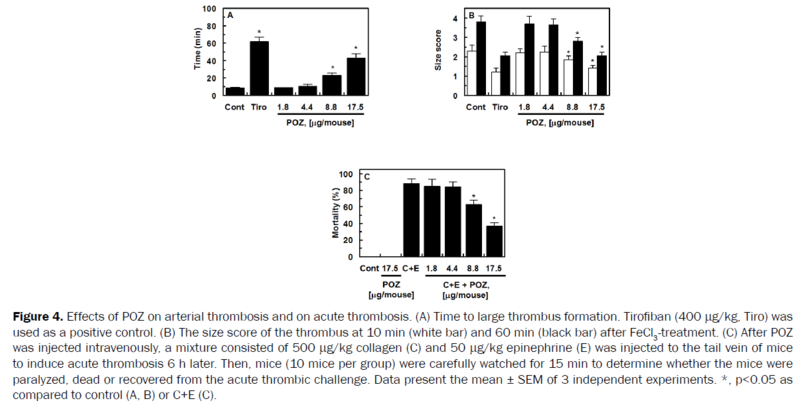 POZ slowed down the thrombi growth (Figure 4A) and reduced the size at 10 and 60 min after FeCl3-mediated thrombus formation (Figures 4B) indicating that POZ could suppress the thrombus formation induced by FeCl3 in vivo. Figure 4: Effects of POZ on arterial thrombosis and on acute thrombosis. (A) Time to large thrombus formation. Tirofiban (400 μg/kg, Tiro) was used as a positive control. (B) The size score of the thrombus at 10 min (white bar) and 60 min (black bar) after FeCl3-treatment. (C) After POZ was injected intravenously, a mixture consisted of 500 μg/kg collagen (C) and 50 μg/kg epinephrine (E) was injected to the tail vein of mice to induce acute thrombosis 6 h later. Then, mice (10 mice per group) were carefully watched for 15 min to determine whether the mice were paralyzed, dead or recovered from the acute thrombic challenge. Data present the mean ± SEM of 3 independent experiments. *, p<0.05 as compared to control (A, B) or C+E (C). In the pulmonary thrombosis model, the i.v. injection of a mixture consisted of collagen and epinephrine to mice resulted the massive pulmonary thrombosis leading to acute paralysis and sudden death (88 ± 5% of mortality). POZ-administered mice had decreased mortality compared to mixture-injected mice (Figure 4C). In addition, the anti-coagulation effect of POZ was also observed in a dose-dependent prolongation of aPTT and PT, when the ex vivo coagulation time was measured (Table 1). In this assay, mouse blood samples were withdrawn after 1 hour administration with POZ because the plateau inhibitory effects of POZ on aPTT or PT were observed after 1 hour (data not shown). Note: aEach value represents the means ± SEM (n=10). *p<0.05 as compared to control. Table 1: Ex vivo coagulation time of polyozellina. In this study, POZ bearing the two pairs of catechol- and acetyl moieties effectively inhibited the platelet aggregation in vitro and in vivo. In previous study, Wight et al. examined the inhibitory effects quercetin and its structurally related flavonoids on collagen-stimulated platelet function in human platelets. They suggested the chemical structural requirements attributed to potent inhibition, especially a B ring catechol moiety . In addition, there is a report showing about the role of acetyl moiety in the inhibition of platelet function in the comparison of the effects of aspirin and choline magnesium trisalicylate (a non-acetylated salicylate) on human platelets . Thus, the two functional groups in POZ such as catechol- and acetyl moieties were supposed to have important roles in platelet inhibition, but it is not clear yet. Noting that the different inhibitory effects of POZ were affected by administration routes (i.v. injection or gavage consumption) if the same amounts of POZ were used as shown in Figure 2B, equivalence of diverse routes of exposure is different and thus the bioavailability or bioequivalence of the compound administrated by gavage consumption and i.v. injection affect pharmacokinetic parameters by ADME (absorption, distribution, metabolism, and excretion [26,27]. 1) Absorption; for POZ to reach into the bloodstream, it usually must be taken via mucous surfaces like the digestive tract (intestinal absorption) - before being taken up by the target cells. 2) Distribution POZ needs to be carried to its effector site. From there, the POZ may distribute into blood vessel, muscle and organs, usually to differing extents. After entry into the systemic circulation, either by intravascular injection or by absorption from any of the various extracellular sites, POZ is subjected to numerous distribution processes that tend to lower its plasma concentration. 3) Metabolism and excretion are not different between gavage consumption and i.v. injection once POZ reached into the blood stream. Therefore, POZ by intravenous injection has better inhibitory activity in vivo compared to gavage consumption. Overall, these results suggest that POZ could act as a potent inhibitor of platelet aggregation for attenuating the risk of thrombosis and cardiovascular diseases, and the further study is required to identify which functional group in the chemical structure of POZ is essential to reveal this activity. In conclusion, we evaluated the anti-platelet effect of POZ derived from a natural product, P. multiplex, on the freshly isolated human platelets and thrombosis mouse model. Based on the cytotoxicity and cell viability assays, it was determined that the anti-platelet effect induced by POZ was not due to its cytotoxicity. We expect that POZ and P. multiplex could be useful to develop the drug candidates or functional foods for treatment and prevention of various vascular diseases through regulation of platelet functions. This research was supported by Basic Science Research Program through the National Research Foundation of Korea (NRF) funded by the Ministry of Science, ICT & Future Planning (NRF-2012R1A5A2A42671316). George JN. Platelets. Lancet. 2000;355:1531-1539. Davies MJ and Thomas AC. Plaque fissuring--the cause of acute myocardial infarction, sudden ischaemic death, and crescendo angina. Br Heart J. 1985;53:363-73. Hwang JS, et al. Polyozellin, a new inhibitor of prolyl endopeptidase from Polyozellus multiplex. J Antibiot (Tokyo). 1997;50:773-777. Chung SK, et al. Antioxidative effects of polyozellin and thelephoric acid isolated from Polyozellus multiflex. J Korean Soc Appl Biol Chem. 2004;47:283-6. Kim SI, et al. kynapcin-13 and -28, new benzofuran prolyl endopeptidase inhibitors from polyozellus multiplex. J Antibiot (Tokyo). 2002;55:623-628. Lee HJ, et al. Kynapcin-12, a new p-terphenyl derivative from Polyozellus multiplex, inhibits prolyl endopeptidase. J Antibiot (Tokyo). 2000;53:714-719. Song M, et al. A Comparison of the In Vitro Inhibitory Effects of Thelephoric Acid and SKF-525A on Human Cytochrome P450 Activity. Biomol Ther (Seoul). 2014;22:155-160. Kim JH, et al. Polyozellin isolated from Polyozellus multiplex induces phase 2 enzymes in mouse hepatoma cells and differentiation in human myeloid leukaemic cell lines. J Agric Food Chem. 2004;52:451-455. Jin XY, et al. Polyozellin inhibits nitric oxide production by down-regulating LPS-induced activity of NF-kappaB and SAPK/JNK in RAW 264.7 cells. Planta Med. 2006; 72:857-859. Lee SH, et al. Polyozellin blocks tumor necrosis factor alpha-induced interleukin 8 and matrix metalloproteinase 7 production in the human intestinal epithelial cell line HT-29. Arch Pharm Res. 2011;34:91-97. Bae JS, et al. Transforming Growth Factor beta-induced Protein Promotes Severe Vascular Inflammatory Responses. Am J Respir Crit Care Med. 2014; 189:779-86. Ku SK, et al. Inhibitory effects of oroxylin A on endothelial protein C receptor shedding in vitro and in vivo. BMB Rep. 2014;47:336-341. Ku SK and Bae JS. Antithrombotic activities of sulforaphane via inhibiting platelet aggregation and FIIa/FXa. Arch Pharm Res. 2014;37:1454-1463. Ku SK and Bae JS. Antiplatelet and antithrombotic activities of purpurogallin in vitro and in vivo. BMB Rep. 2014; 47:376-81. Yoo H, et al. Antiplatelet, anticoagulant, and profibrinolytic activities of cudratricusxanthone A. Arch Pharm Res. 2014;37:1069-1078. Lee W, et al. Emodin-6-O-beta-D-glucoside down-regulates endothelial protein C receptor shedding. Arch Pharm Res. 2013;36:1160-1165. Ku SK, et al. Antithrombotic activities of oroxylin A in vitro and in vivo. Arch Pharm Res. 2013. Lee W, et al. Antiplatelet, anticoagulant, and profibrinolytic activities of baicalin. Arch Pharm Res. 2015; 38:893-903. Ku SK, et al. Antithrombotic activities of aspalathin and nothofagin via inhibiting platelet aggregation and FIIa/FXa. Arch Pharm Res. 2015;38:1080-1089. Izuhara Y, et al. Inhibition of plasminogen activator inhibitor-1: its mechanism and effectiveness on coagulation and fibrosis. Arterioscler Thromb Vasc Biol. 2008;28:672-677. Boullin DJ, et al. The mechanism of adenosine diphosphate induced platelet aggregation: binding to platelet receptors and inhibition of binding and aggregation by prostaglandin E 1. J Physiol. 1972;221:415-426. Diehl KH, et al. A good practice guide to the administration of substances and removal of blood, including routes and volumes. J Appl Toxicol. 2001;21:15-23. Wright B, et al. A structural basis for the inhibition of collagen-stimulated platelet function by quercetin and structurally related flavonoids. Br J Pharmacol. 2010;159:1312-1325. Danesh BJ, et al.Comparison of the effect of aspirin and choline magnesium trisalicylate on thromboxane biosynthesis in human platelets: role of the acetyl moiety. Haemostasis. 1989;19:169-173. Turner PV, et al. Administration of substances to laboratory animals: routes of administration and factors to consider. J Am Assoc Lab Anim Sci. 2011;50: 600-13.